It must have happened at least once to every wine lover: a particular vintage passes your lips and, just like that, you realize the wine you are drinking surpasses anything you have ever tasted. Though the word wine is used to describe so many vintages fermented from so many kinds of grapes and vinified in so many ways that imply sheer diversity and range, yet it is true: every wine you drink from now on will in some way be compared to this one. Because this is the best wine you have ever tasted. THE NOBLET VINEYARD IN VOSNE-ROMANEE. THE N74 RUNS BETWEEN THE VINES AND THE BUILDINGS IN THE DISTANCE. I am no millionaire, so I have never tasted La Tâche or Le Montrachet; no bottle of Romanée-Conti has ever graced my table. These remain only names to me which make me think of a higher purpose, that I should be earning more money. But in July of 2007, while on a camping vacation in France, I pulled my old Renault 5 off the N74 into Vosne-Romanée and bought a single bottle of wine from the village wine shop for €16. The teenage girl who was working there said it was good. A week later I was sitting in a campground in the Rhône, overlooking a purple field of lavender, when I decided that the Crozes-Hermitage I was sipping was not bringing me any pleasure. So I fumbled under a pile of luggage in my Renault and unceremoniously pulled out the bottle I had bought in Burgundy: Vosne-Romanée, Martin Noblet 2000. It was after sunset, so the light was not appropriate to judge its colour. But the bouquet was seductive: red fruit, spicey with a bit of garden tomato, leather and oak. A full-frontal rush of intoxicating dark berries with a little pepper in the mouth. Absolutely blended tannins with fruit in an extremely long-lasting aftertaste. Perfect finish. I sat in the dark in my car, savouring it. Back in Amsterdam I could not find the wine; even an internet search gave me little, other than a contact address and what appeared to be a review in Japanese. It seemed no-one had heard of Martin Noblet. So I decided I would go back to Vosne-Romanée and meet him. 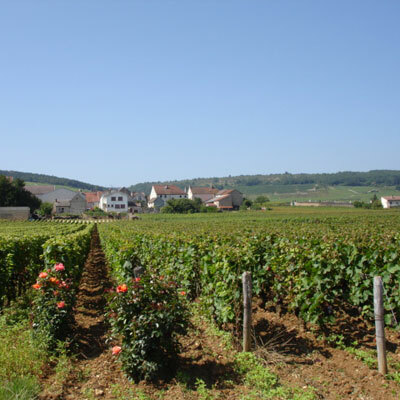 On a scorching hot day this past August I walked up the drive of a modest house in the village, with Pinot Noir vines stretching in rows to the nearby N74. Bernard Martin came out to greet me. This quiet, unassuming man, now 70 years old, has lived in the village since 1966 and owns 3,5 ha of vineyards in Vosne-Romanée and Gevrey Chambertin. He started winemaking in his twenties but his son Fabrice makes the wines now, by the name Martin Fabrice. He must be proud but he is certainly not boastful: upon hearing me praise his 2000 vintage, he merely raised one eyebrow and said, "Ah, then you must try the 2001, it is far better." So we sat in his basement and he pulled the cork out of a 2001. Anticipation. The nose was familiar: fragrant cherry, fresh-cut tobacco, leather and oak, this time with a hint of vanilla. Even the garden tomato was there. Taste: delicate red fruit, lightly peppered, with modest oak and good acidity. A beautiful, elegant wine, perhaps even faultless, but... I could not help feeling a little disappointment. As good as it was, it did not in my mind surpass the wine I had drunk a year before, which is now enshrined in my memory. But is memory faultless? Back in Amsterdam again, I let two friends taste the 2001: Ron Cavé, owner of the wine shop Van Bakel en Cavé, and Ed van der Berg, owner of Ed's Wine Import. "Beautiful, honest Burgundy," they told me, "precisely as it should taste." When the 2000 vintage was made, Bernard Martin was 62 and the wine was made at home, in the garage and basement, as has traditionally been done by small producers in Burgundy. This is in stark contrast with the modern vinification methods employed by larger houses. To each his own. You can keep the Drouhin. For me, the best Burgundy is still made at home.